This week’s #WebsiteWednesday is extra special – you might have already even spotted this amazing artist and website yourself! 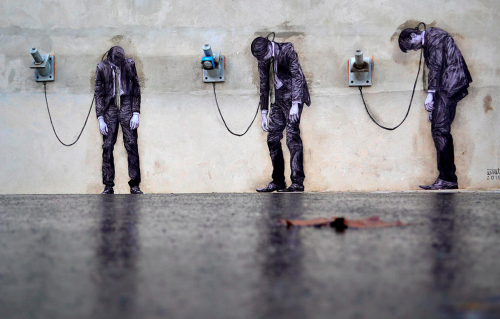 Charles Leval, aka Levalet, is a 27-year old street artist from northeastern France. 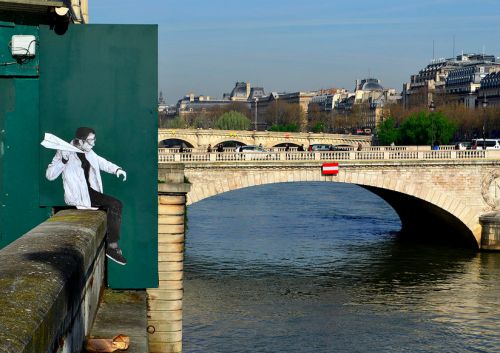 His recent work covers the streets of Paris with his hand drawn characters that interact with the urban architecture. 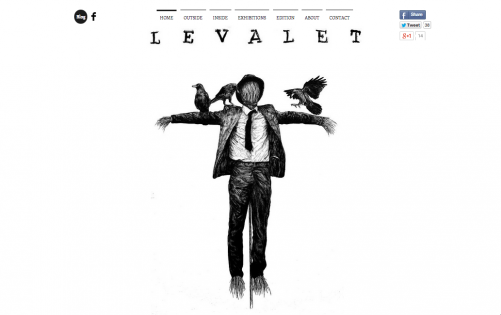 Levalet shared his art with the online world through Levalet.org, which he now moved to Levalet.xyz. 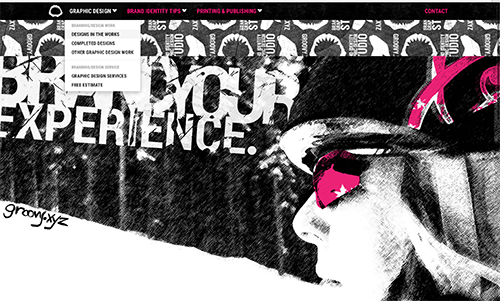 On his newly designed portfolio site, he is certainly capturing more fans throughout the world! Does his art look familiar to you? That’s because Levalet was recently featured in huge outlets like Huffington Post, Visual News, the Laughing Squid, and even on the main Instagram account where he racked in 615,000 likes! On another exciting note, while we were researching through everything Levalet, we also experienced a .xyz meta moment of sorts. Another .xyz site called Alter Minds, which blogs about art, culture, history, and even about hyperrealistic paintings of greasy hamburgers (what?!) 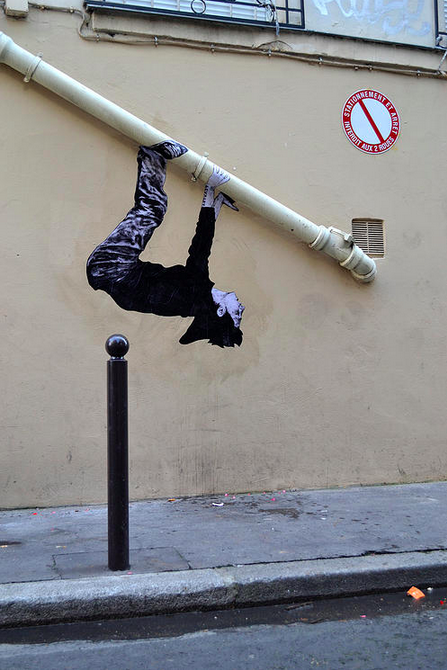 also featured Levalet’s artwork! That’s a .xyz reporting on another .xyz. How exciting is that? Have you spotted any .xyz websites in the wild, #GenXYZ? Keep us posted through Twitter, Instagram, or Facebook, and we’ll be sure to feature the best! With so much breaking news and exciting announcements all around (.Rent, .College, the XYZ media frenzy, SXSW YouTube videos…phew), it’s been quite some time since we featured our favorite .xyz websites on #WebsiteWednesday. Today’s #WebsiteWednesday is dedicated to one of our favorite women’s fashion sites, ameri.xyz, which recently revamped itself to introduce its vibrant vintage-inspired spring line. 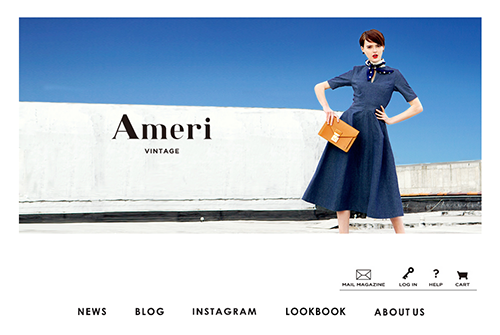 Naoko Kuroishi, the former Visual Merchandiser at a popular fashion brand in Japan (EMODA), launched her own fashion line and eCommerce site, Ameri Vintage on ameri.xyz. She’s a pretty big social media celebrity herself – an official blogger on Japan’s largest blog platform, Ameblo, and over 53,000 dedicated followers on Instagram. Naoko’s new venture has already been covered in the fashion industry blogs and brings a New York inspired look to her Japanese customers. What’s trending in your book, #GenXYZ? Let us know or tag us in your favorite looks through the usual Twitter, Facebook, and Instagram! What do Lady Gaga and .xyz have in common? They’re both building communities over the web through Place.xyz, formerly known as Backplane. Did you know that 46% of adult internet users post original photos or videos online that they themselves have created? That means that despite the uniformity of Facebook, Twitter and the like, nearly half of all adults are creating their own unique content. Shouldn’t there be a social network that provides a creative outlet for these users? That’s where today’s very special #WebsiteWednesday, Place.xyz comes in. 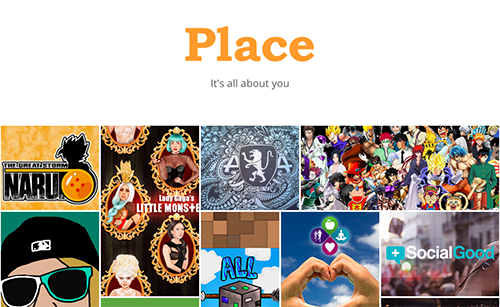 Place.xyz isn’t just any website, it’s the flexible platform for creating any themed social network. Place.xyz lets you express yourself, share your passions, have meaningful conversations with likeminded people, all while letting you explore and discover other networks! Their tagline says it all: it’s all about you. With the creativity and versatility offered by .xyz, Backplane was able to reinvent and rebrand themselves with a short, memorable domain name that embodies their mission and vision. And that’s how Place.xyz was born! Ready to find your Place on the web? Check out Place.xyz and be part of the beta group today. With so many exciting updates – from the NamesCon auction (the highlight was student.xyz selling for $1000) to the .xyz Web Design Contest – we haven’t had a proper #WebsiteWednesday in quite some time. But first. Check out this awesome video fresh on YouTube. You might’ve already heard that .xyz is the largest and fastest growing new domain extension, but how large and how fast, you ask? This video will show you exactly that – and also give you a better glimpse into all the awesome .xyz websites going live around the world. Now for our very first #WebsiteWednesday of 2015! For all the fashionistas out there, there’s no denying that your favorite bloggers have become daily inspirations for your #OOTDs. Julia Daoud aka Simply Jules, is not only a fashion blogger, but also a junior at DePaul University studying to complete her degree in Health Sciences. I chose my domain when I decided to start a fashion/lifestyle blog. My style is very simple and I strive to live a minimalistic lifestyle so thats where SimplyJules came from. I chose .xyz because I loved the idea behind the creation of .xyz and because it’s so simple and easy to remember… .xyz just makes sense. There you have it, #GenXYZ. The first of many amazing #WebsiteWednesdays to come for 2015. Did you find any great .xyz websites in the wild over the holidays? Let us know @xyz through Twitter, Facebook, and Instagram! On this last day of 2014, which also happens to be the year’s last #WebsiteWednesday, we’ve asked a couple members of Team XYZ to reveal their favorite .xyz websites in the wild! 2014 was a huge year for us (you know, launching the most popular new domain extension in the world), and we wanted to acknowledge #GenXYZ and the amazing sites that have gone up in the six short months since we went live. Starting off with the big man himself, here are some of our favorite .xyz sites and why we think they’re an amazing representation of the growing #GenXYZ community. The niamap technology is incredible. It is fascinating to see how technology evolves and I am very humbled to see new innovators choosing .xyz to host their latest innovations. It’s a simple and elegant site with all of the modern touches like parallax scrolling, background animation, and responsive design. I also like how the team behind UMake used .xyz as part of their app’s branding – quickly express your ideas on the X, Y, and Z coordinates. Genius. This UK-based nonprofit rebranded from Homeless-International.org to their first choice name with .xyz. Not only do they have a great looking website, but they also serve an amazing purpose on an international level. This sleek and modern clothing site is a great example of how a small business can easily expand its market presence outside of its own country. Its .xyz domain transcends those boundaries and makes itself marketable to Austria, Germany, and Switzerland, as well as the rest of the world. It’s a constant flow of amazingly curated underground house and hip hop music with new playlists you can easily stream from Soundcloud. HouseOfLords.xyz makes it so easy to discover my new favorite songs. And its clean design is gorgeous to look at. Never.xyz is a site that I found to be both interesting and amusing. This site has taken the timeless game of “Never have I ever” and expanded its reach globally – so now you can play with anyone online. You can also submit your own questions, which is just as fun as answering questions! As we countdown the hours, then seconds until 2015, we can’t help but feel thankful for all your support, #GenXYZ. We have a LOT in store for you, starting off with a huge announcement first thing in the new year that YOU can all be a part of. Have an awesome end to 2014 and we’ll see you on the other side! And the countdown to 2015 begins! What were your favorite moments of 2014, #GenXYZ? Ours was hands-down launching .xyz in June and building the Generation XYZ® community with all of your support. For #WebsiteWednesday, we’re flipping things around with an exciting announcement (hint: YouTube) to celebrate another huge milestone: .xyz is the first new domain extension to hit 750,000 registrations! The only reason why we can feature such amazing sites on the regular is because of you, #GenXYZ. Because bloggers, artists, musicians, photographers, developers, startups, small businesses, and nonprofits like you are pushing awesome .xyz sites live, #WebsiteWednesday exists. Inspired by all the great .xyz sites, we are super amped to announce our very first video series: Ways to .xyz. Check-out this teaser video for what to look forward to! “Ways to .xyz” will explore all the ways you can use .xyz to achieve your goals. Whether you’re looking to have your personal voice heard or itching to turn your idea into a business, .xyz can help you jump start that journey. What ways do YOU use your .xyz? We’re always open to suggestions for our video series, so don’t hesitate to reach out through the usual Twitter, Facebook, and Instagram. Hey there, #GenXYZ! It’s that time of year to reflect back on the amazing year and plot away for the even better year ahead. Today, we’re excited to announce our very first Buzzfeed quiz and celebrate with a #WebsiteWednesday that will soon grace your bookmarks. Brought to you by the folks behind Minion Made, an innovative web development company based in New York, TechTalk.xyz curates the best of the freshest tech news with the help of their very own developers and technology buffs. The easiest way to get the best of the best in tech news? Be sure to follow TechTalk.xyz on Twitter @techtalkxyz! 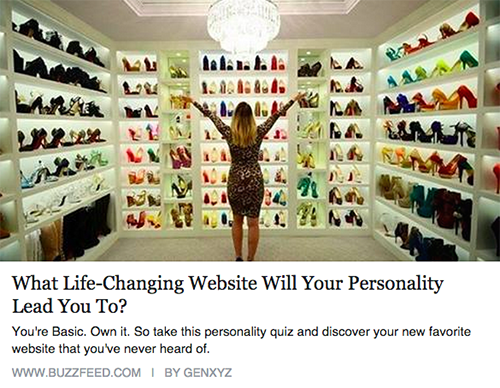 And finally, we present to you, our very first Buzzfeed quiz! Take this quick personality test and we’ll match you with your new favorite website that you never knew existed. Be sure to let us know on Twitter, Facebook, or Instagram your results and what your new favorite website is!